When my wife and I were dating, Heather always enjoyed when my Mom would make Potato Soup and Top to Bottom Ham and Cheese Bread. Only back then, we had no idea what Top to Bottom Ham and Cheese Bread was. Heck, I don’t even remember what we called it back then. It was just that “ham-bread-stuff” that Mom makes with Potato Soup. Heather wasn’t satisfied with it not having a name and so one night during a dream, it came to her. Now I have no idea where it came from or how she got that name for it, but you know it’s gotta be good if she was dreaming about it. Now that the weather is getting cooler, this is a perfect weekend supper since it does take a little time to make the soup. If you’re in a hurry though, you can bake the potatoes in the microwave rather than the oven to cut out a big chunk of time. Bake 5 of the potatoes. We typically do it in the microwave to save time and it seems to work perfectly, but you can do them in the oven if you prefer. Peel the other 5 potatoes and dice them roughly. Combine the diced raw potatoes and chopped onion with 1 1/2 tablespoons of salt and 2 cans of chicken broth in a large stock pot. Once the potatoes are soft, mash everything in the stock pot together with a potato masher. Add 1 can of cheddar cheese soup, 8 oz sour cream, 1 stick of butter and 5 cups of milk. Peel and roughly chop the baked potatoes and add them to the soup along with 2 cups of cheddar cheese. Top with chopped green onions, more cheddar cheese, and crumbled bacon if desired. Cut the loaves of bread in half lengthwise as if you’re going to make a sandwich. Combine the 1 cup mayo and 2 cups shredded cheddar cheese in a bowl and spread on both side of both loaves of bread. Place thinly sliced onion and ham in each sandwich to your liking. Wrap sandwiches in aluminum foil and and bake in 350 degree oven until cheese is melted and the sandwiches are heated throughout. 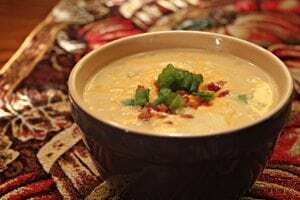 This yummy Potato Soup is sure to warm and fill every tummy! Combine the diced raw potatoes and chopped onion with the salt and the 2 cans of chicken broth in a large stock pot. Add the cheddar cheese soup, sour cream, butter and milk. Peel and roughly chop the baked potatoes and add them to the soup along with the cheddar cheese. Preheat the oven to 350°F. Cut the loaves of bread in half lengthwise as if you’re going to make a sandwich. Wrap sandwiches in aluminum foil and and bake until cheese is melted and the sandwiches are heated throughout. 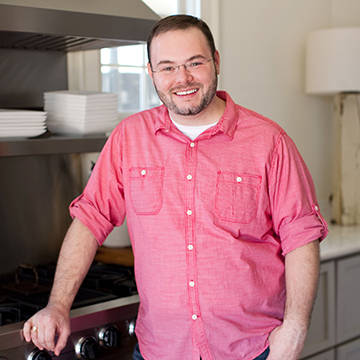 I clicked on the link from Christy’s Southern Plate for the above recipe. I also clicked the “like” button on the side – I hope that this means I will receive your recipes. I am beginning to think I have a problem as I subscribe to 3 food blogs -hmmmm. Welcome and thanks for checking out Southern Bite! You can also subscribe to our email list and you’ll receive an email each time we post a new recipe. 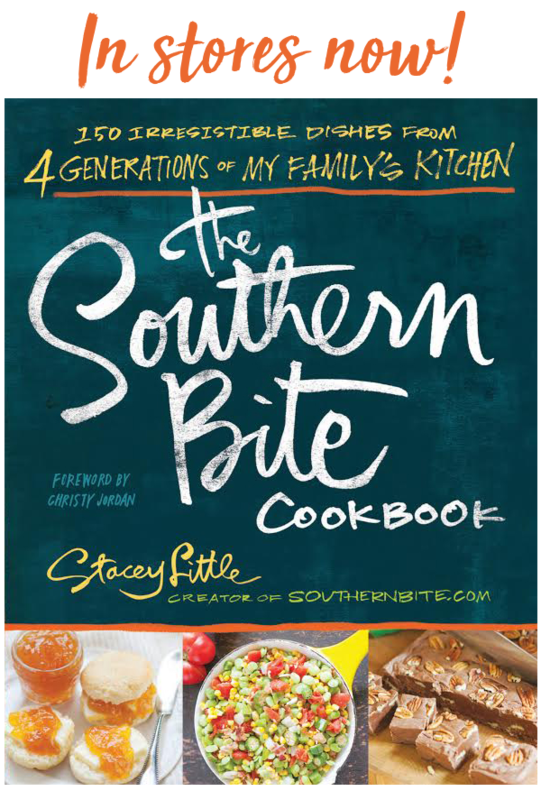 Sign up at: http://southernbite.com/?page_id=526. Again, thanks for checking us out! Welcome to the club, I think I follow 50+ food blogs! I love the ham and cheese sandwich along with potato soup, who could ask for more. Hi Sandy! Thanks so much for the note. It sure is a favorite in my family! MMMM, was this great! I made the top to bottom Ham and Cheese Bread for the Superbowl. It was totally yummy and thanks to Christy Jordan, I’ve now signed up for Southern Bite. Keep the great recipes and stories coming! This Northerner from Chicago loves both blogs! Welcome! And thanks so much for letting me know you enjoyed it! 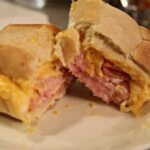 After your guest post of “Top to Bottom Ham and Cheese Bread” on Southernplate.com I had to try it. I figured it was just a fancy way to make a ham and cheese sub, BOY WAS I WRONG. I think it’s the raw onion on the classic ham and cheese, but I suggest not varying from the directions. This is a super simple meal, made with top notch ingredients, that deliver an over the top taste. A great keeper for sure, we loved it. David! O. M. G.! Thanks for such a wonderful comment. It just makes me grin like a possum to see comments from when people try my food. I’m so glad you enjoyed it and I hope you’ll be a regular around these parts! Stacey – I finally got around to making your “top to bottom ham & cheese sandwich” last night for an early supper. I served soup too, but we all filled up on the sandwich first. We loved the ooey gooey mayo/cheese. Thanks for the recipe. I enjoy your website. That’s great, Alana! I’m so glad y’all enjoyed it and even more glad you came back to tell me about it! Hi Stacey, I have just put this yummy looking sandwich in the oven and look forward to tasting it…once question though, are you supposed to prepare the cheese/mayo drsg for each loaf of bread? It took the whole bowl to coat one loaf of bread. Just wondering. 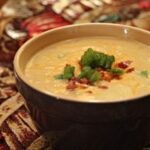 Cannot wait to try your potato soup recipe…YUM! It all depends on the size on your bread. You might be have to make two batches. I use two thin loaves and only need one, but several folks have used big loaves and needed more. Good luck and let me know how it all turns out! Welp, I over did it. I should have tried to spread a little better, it was tasty, but definitely should have went easier on the spread. Will be making again, Thanks! Can someone tell me what size cans of chicken broth to use for the potato soup? Hi Carol! 14 oz cans will do the trick! It turned out great! My husband and son loved it, and I did too. It was an easy recipe and makes a lot, so there will be leftovers … which is all good!! Now I want to try the ham and cheese bread. Fantastic! I’m SO glad to hear that! Can you half everything and have it come out the same? I dont think potatoes freeze well and I dont have the room to anyway..haha. Its only me and my boyfriend, read it made a lot and I dont need leftovers…? Thanks so much! I’m glad you enjoy everything! Yes, you can half this recipe without any problems. Enjoy! WONDERFUL! I’m so glad you (and your neighbor) enjoyed it all! I can’t believe I found another southern and bama food blogger I love it!! I seriously cannot wait to try this one out come football season !! Roll Tide !! So glad I found you Stacey!! Well I’m so glad you found me too!! Welcome, welcome!! bread., with some of Christy’s pickled onions and ice cold sweet tea. Invited some neighbors and we ate out on the deck overlooking Lake Michigan on a spectacular summer night . We all absolutely loved the meal, the Top to Bottom Ham and Cheese bread came in first place, followed closely with the pickled onions and the potato soup. One of my friends stood up towards the end of the meal, spread out his arms, looking up at the sky and said, ” It don’t get any better than this, take me God I’m ready”! Thank you Stacy for the recipe, for a country boy like me, I agree with my buddy, it don’t get no better than that. You have just made my day with your comment! The praise couldn’t get any better! That does sound like a perfect evening. I’m so glad you and your friends enjoyed the recipes. Stacey-I am coming back to let you know I made this last week, regardless of the lack of cooler weather. When my daughter heard I was making potato soup she wanted it that night. This was very easy to make, even on a weeknight. It was also the most delicious potato soup ever. I garnished with bacon and cheese which really put it over the top. The leftovers were just as wonderful. This does make a huge stockpot full so it’s great to share with friends and family. Thank you so much for a new family favorite. I made the soup last week and it was a total success!! My teenager said it was literally the best thing he has ever eaten and gave me at “15” (out of 1-10). It was so easy and soooooooo good! Thank you for providing us with your stories and good eats. I have made several of your dishes and they all have been really really good. Watch out Paula!! LOL! Thanks, Keri! I would say that is HIGH praise! Just wondering if it’s possible to freeze the leftover soup . . . since it makes so much — or would freezing it ruin it? I can’t wait to try it. I love, love, love your website and your stories you always write with your recipes. Have a great day! Hi Carrie! Thanks so much! Yes, you certainly can freeze this! This soup & sandwich are to die for. Especially on a cold day in the mountains. It does make about a 3/4 gallons of soup-however, because it is so delish, we do not need to freeze it, as it is eaten right up! 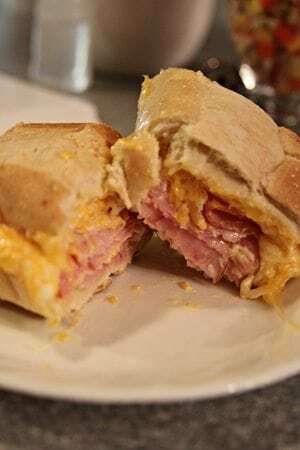 And the ham sandwiches remind me of poorboys when I was a kid, only way better cause these are handmade rather that bought in the frozen section at the grocery. So glad you’ve enjoyed it! !